Draco Spring is the global leader in spring manufacturing. A family owned and operated business since 1969, Draco specializes in a wide variety of springs, from government contracted specs to the tight tolerances of NASCAR racing. Draco's purple springs are the 1st choice for the top three NASCAR divisions. Draco now offers a premier spring line for all levels of racing, worldwide. Not sure what your need? Give us a call at 877-604-8077 and we will be happy to help you out. Draco rear coil springs are available in a variety of sizes for applications including asphalt, dirt, drag, drifting, off road, road course racing and much more. 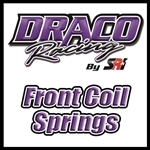 Draco Spring 6th Coil comes in 3.00" FL and 2.250" OD with 400-600 rates. Draco Spring Coil Spring Adapters come are made of lightweight aluminum and come in multiple sizes. Designed for coilover springs including 2.5" to 3.0", 2.5" to 3.5", 2.5" to 3.5" and 2.5" to 5.0". Draco legend car and bandolero car springs are available in a variety of sizes. Our springs have the fewest coils and largest coil gap on the market with the maximum amount of coil removed to keep weight down and achieve maximum travel with a linear rate. All springs are preset to prevent sag. Draco Spring now releases the industry standard for open wheel modified springs with a 5 Inch OD and 9.5" free length with rates from 350 to 750 pounds. Draco Springs introduces for 2018, bump springs for all levels of motorsports including 2.0 inch, 2.5 inch, 4.0 inch and 3.5 inch progressive bump springs. Draco coilover springs are available in a wide variety of sizes for applications including asphalt, dirt, drag, drifting, off road, road course racing and much more. Draco front springs are available in a variety of sizes for applications including asphalt, dirt, drag, drifting, off road, road course racing and much more.